I was waiting for my young students to troop into the classroom at a play centre called Hansel and Gretel in Chennai. We were running a short course on reading skills for students in the age group of 5-8. It was to be an activity-based learning session so that the little ones would not get bored and distracted. It would be held on 10 Saturdays for a two-hour duration with a 10 minute break for the kids to have a quick snack or rush to the washroom! As I placed my material on the table while waiting, young girls and boys walked in, skipped in or dashed in, unable to hide their curiosity about what was going to unfold! I stopped what I was doing and watched them as some of them confidently smiled at me, while others nervously avoided all eye contact. Soon they sat down on the floor and began fidgeting with their pencils, the buttons on their shirt or the ribbons in their hair. It was a treat to study these baby faces! One child in particular caught my attention much more than the others…a small built wide-eyed boy whose face seemed to be glowing with a brightness that set him apart from all the others. There was an air of confidence and eagerness in this child, who I later came to learn, was five and a half years old. As teachers, our instincts tell us that it is these kinds of students who will keep us interested in our profession! The confident way in which the little boy seated himself on the floor, and looked to see what was going to happen next, was an indication that the child was a regular visitor to the centre and therefore felt very much at home. We were going to do an activity in which words had been cut into syllables. It was the task of the students to piece the syllables together to form the correct word. 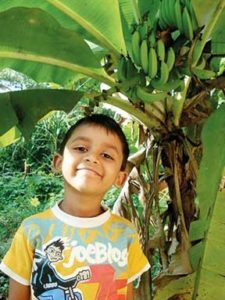 The boy, Shreyaas Subash, spoke English fluently, with the correct pronunciation, and almost flawlessly. I was impressed by such communication skills in one so young. By the end of the 10 weeks, I became very well acquainted with my little students since they were so open and expressive about their likes, dislikes and the difficulties they had. Shreyaas said that he travelled from Chengalpet to T Nagar every Saturday, covering a distance of 60 kms each way. He added that it took him about two hours to travel the distance; then he spent two hours in class, and travelled back another two hours. I was speechless to discover that a child would want to travel such a long distance in order to attend a class during the weekend. When I asked whether he didn’t find it tedious, he replied in his typical spritely fashion, “I enjoy the classes, and so I don’t mind.” He then continued, “I will attend every session that you conduct here.” There was a note of seriousness in his voice as he spoke, and although I was touched by his words, I brushed them aside. But true to his word, he kept attending every single programme…whether it was a grammar session, a spoken English session, an introduction to German, YLE…he was a constant and bright factor in my class. He continued to be the same serious, bright and attentive Shreyaas in all the sessions. Familiarity with the teacher did not lead to misbehaviour in the classroom. He seemed ever so hungry to improve his language skills; the commitment in one so young was astounding! I met his mother during feedback sessions we had every now and then. I learned that the parents are both doctors. The mother always received the feedback in a positive fashion, adding that she was ready to do all that it takes to make sure her son excelled in life. Two years later, after one class, Shreyaas’s parents met me. The father asked if I would teach his wife English so that she could become more confident in speaking the language and talking to others in the medical profession. Since they lived so far away, I suggested having classes over Skype and that is what we did. Being a doctor, she knew very well where it was she needed to use English and she learned what she felt had to be learned. Naturally, I learned a lot about the person and the family… and these classes further confirmed my first impression… this was certainly a special family, a family wherein each individual was setting a goal for himself/herself and making sure that they attained that goal. Shreyaas continued to come to Hansel and Gretel on weekends. When he was in class 5, the parents asked whether I could conduct similar Skype classes for him twice a week, basing the classes on the school curriculum and of course going beyond. 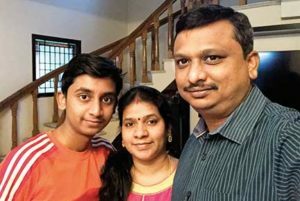 I would have hesitated conducting virtual classes for such a young boy, but I knew that the boy would concentrate even during virtual classes, and therefore we began another long and fruitful journey virtually… until he appeared for the class 10 CBSE examination. We had regular days and regular hours, but there was flexibility within this. If my student had tests or exams, we rescheduled the classes; when I was travelling on work or had classes myself, we would adjust. Classes were scheduled early when school had half a day; when there were extra classes in school, we scheduled them late. There was always at least a 24-hour notice and it was mostly done via e-mail so that we were not disturbing one another. In doing this, my student learned to check his mails regularly; he also learned how to write a polite formal mail and reply to such mails. I made sure to edit his mails so that he would understand there is a difference between the SMS language and the e-mail language. Mails had to be acknowledged…that was something my student learned. I think in our journey together, he imbibed a lot of life skills because I had the luxury of constantly monitoring him and critiquing him. I became both a teacher and a mentor, and therefore it was easy for Shreyaas to accept feedback that sometimes did not present him in a flattering light. We were always a step ahead of the school and therefore there was time for more grammar, vocabulary and writing exercises. Homework was based on the school English book, but the writing was more extensive and critical. Since homework was submitted as a word document, my student also learned how to type effectively and quickly… again, another skill well learned. I corrected the answers by highlighting and commenting on the sections that needed attention. I sent the corrections prior to the next class so that the document could be downloaded, the corrections studied, and we could discuss how the writing could be improved. We avoided wasting class time on account of this. I wanted my student to get better and better at answering comprehension questions and therefore I would send him a passage 10 minutes before class. We had a mutual understanding that he would not open the document before class started. I had Shreyaas go through the passage and key in the answers during class time so that he could understand that there was an absolute need to complete the task within the stipulated amount of time. When there was a test, I chose certain questions and sent it on Skype chat just as my student appeared before me. I would tell him to write down the answers within a certain number of minutes, and at the end of the class to scan and send the answers to me. This method helped him comprehend whether he was writing fast enough; it also helped me understand whether he was writing so fast that his handwriting was becoming illegible! By doing this, I could get him to work on differentiating between the c and the e and ensuring that the sentences began with a capital letter and ended with the correct punctuation. 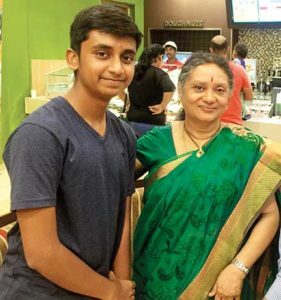 Yes, we got into detailing, which may have been frustrating at times, but it is these small insights into writing that ultimately helped him secure the 92 per cent that he got in the 10th standard CBSE English paper this year! The constant lecturing on legibility made my student understand that presentation of the answers is as important as the content. The fact that I had only one student also allowed me to discuss other aspects of language such as idioms, common errors and pronunciation. When there was a debate or a speech competition in school, Shreyaas always got selected. He was always chosen to perform in plays, again because of his ability to speak well. He was confident and excelled at these events. He would share the feedback he received from the judges and his teachers. All the attention that he got did not make him swell with pride and that is what makes him an exception. He once said, “When my Vice Principal asked me how I am able to speak such excellent English, I told her that I have a special Ma’am who coaches me.” We had time to discuss study skills, examination fear and stress, what he wanted to become in life and how he should go about working for it. Whenever he had a school test or an exam, he would diligently scan the test/exam paper and discuss it in the next class. Once the answer script was returned, he made sure to scan that too and discuss the corrections. Shreyaas’s mother interacted on the phone occasionally to share her concerns about the child and also to find out how he was faring. The 9th standard brought a lot of pressure on my student and there was peer pressure from the wrong kind of students who were more into gaming and persuading my student to become obsessed with it too. He would discuss all this candidly during our class hour. Sometimes the class was more dedicated to resolving a pressing issue. His mother would also request me to help him with certain issues since he seemed more ready to listen to me than to anyone else! The pressure from all sides and the fact that he was a teenager made him slightly irregular… there were always excuses about the delay, the inability to complete the homework or be ready for the test. He overcame these when he understood what was at stake and also when I indicated that it was no longer interesting for me to continue the classes. I could say this offhand because I knew the child and the child knew me; I was sure that he would take it in his stride and bounce back… and bounce back is what he did. He had the courage to do what many adults themselves would not do. He wrote a mail of apology and entreated me to continue the classes. The parents did not come to the rescue of the child. Yes, the mother spoke to me and said she respected my decision; she said she would be grateful if I could continue the classes after a break. The parents allowed their only child to learn a lesson in life… if you value someone, do not transgress the rules that have been laid down. The last year was hectic with portions to complete, tests to get done online and of course all the pep talks to ensure that my student did well. I don’t remember now the long hours I spent designing a test or looking around for exercises that would take his language skills to a higher level… all I remember now is the bright spark in his eyes that always kept compelling me to continue, wherever I was. Yes, I had seen the child in real life before; but virtual teaching seemed no different from classroom teaching. I could mould, groom and encourage a child over long distances; it was possible because I cared to know the child and also had the time to know the child. When this can happen in virtual teaching, what are the possibilities in the classroom if there is a classroom teacher who remains with a particular set of children for many years? Variety is the spice of life and it is important for children to be taught by various teachers; but a constant factor would be a definite advantage. Also, when parents are involved in their children in a way that gives them the right amount of freedom with the right amount of restriction, they probably offer the teacher the perfect student to guide! My 10 year journey ended aptly when my student and his parents met me in person after the board examination results were announced. To me, it was both a joyous and proud occasion!